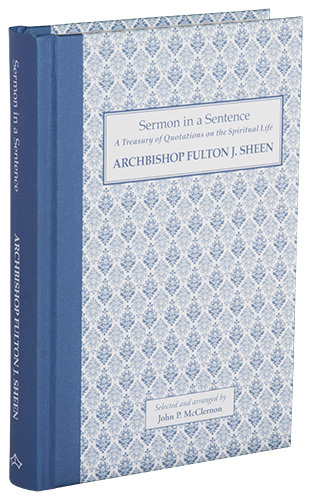 This handy little book contains hundreds of direct quotes and short sayings of Archbishop Fulton Sheen, arranged according to the Christian virtues and other spiritual topics, allowing the reader to encounter his thoughts about particular aspects of the Christian life in a more organized manner. The first fifteen chapters are arranged under virtues corresponding to the classical Fifteen Mysteries of the Rosary, making this ideal for anyone to use for daily spiritual reading and inspiration. Reading these sayings while reciting the Rosary is like praying it with Archbishop Sheen, joining both prayer and the study of his writings in one great journey of advancing all the more in holiness and the love of God. The Venerable Fulton Sheen (1895 � 1979), Titular Archbishop of Newport, without doubt ranks among the greatest Catholic evangelists of the modern day. He was also a distinguished philosopher and theologian who wrote numerous books and articles about the Faith. Behind the Emmy Award-winning TV personality was a man of deep piety who spent an hour in Eucharistic adoration every day and whose apostolic work was rooted in a profound interior life. His heroic virtue has been officially recognized by the Holy See. Fulton J. Sheen was an extraordinarily wise man. He had an ability to express wisdom and holiness in a unique and most attractive way. He made countless viewers, listeners, and readers want to be better persons, better Christians. His carefully-chosen, well-chiseled words were all ordered to the heavenly throne. His desire in life was to help others become holy and he did so on a monumental scale by the spoken and written word. He taught us about the Missions. He led the office in which I am now privileged to serve, and he did so for 17 years as national director of the Society for the Propagation of the Faith. In the emerging electronic world of the 20th century, Archbishop Sheen became one of God�s great instruments of communication as if born with a microphone in his hand! He has been called �the greatest preacher of the 20th century� for a reason. He was also a prolific writer and author of books, more than sixty of them! In very attractive fashion and woven around the themes of the Mysteries of the Rosary, John McClernon presents a compilation of inspiring, encouraging, challenging sentences of this great modern apostle. Some are clever, some deep. All are thought-provoking. These lines will help us to know that life is worth living, as Archbishop Sheen has always taught! They will help us to pray, to understand, and to be, as was Fulton John Sheen in his own right, an attendant at the throne of God, even as he walked with us in modern-day America. I invite all readers to enjoy these words, absorb them, and reflect upon them. You will come to know God better, and our beloved Blessed Mother, to whom the Archbishop dedicated his priesthood. May God give success to this effort so that even more of the Lord�s flock will be inspired by the wisdom of Archbishop Sheen. There are many Catholics who greatly desire to deepen their spiritual life and love of Christ by delving into the treasured writings of the Church�s great spiritual masters. But how many do so? The culture of today leads us to embrace such busy lifestyles. All too often the time needed to feed the soul takes a back seat, and we end up spiritually starved. The Sermon in a Sentence series is designed for just such a person. Imagine spending quality personal time with Archbishop Fulton Sheen, certainly one of the most influential and effective preachers and spiritual writers of the 20th century. His remarkable ability to synthesize, organize, and communicate timeless Catholic truths to the struggling souls of our times would undoubtedly lead one to a deeper love and appreciation for Jesus Christ and His Church. His words and advice � whether from his many books or as spoken so gracefully and energetically over the radio, television or in person � were like a spiritual tuning fork, bringing back into harmony with God millions of the men and women of his time. Archbishop Fulton Sheen is considered by many to be a prophet of the 20th century, calling and exhorting us to come back to our spiritual senses and to ground ourselves in the wisdom and teachings of Jesus Christ, as communicated down through the centuries by the Church He founded over 2,000 years ago. This book has been designed to bring to you the inspiration of his words in a very simple and direct format. Hundreds of short quotations taken from the writings of Archbishop Fulton J. Sheen have been organized and classified by the Christian virtues of which they speak, and then arranged to complement the Rosary, proceeding from the first Joyful Mystery (The Annunciation, with its anchor virtue of humility) to the fifth Glorious Mystery (The Crowning of Mary, with its anchor virtue of devotion and love of Mary). The Luminous Mysteries, introduced by Pope John Paul II as an optional addition to the Rosary, are also included. For those who choose to use these excerpts for meditation while reciting the Rosary, we have placed a type ornament after the first ten quotes of each decade, to mark the end of a decade. Additional quotations follow for use with a Rosary or for private devotions or meditation. A selection of quotations on other spiritual topics of interest follows, bringing to the reader a sample of Sheen�s reflections on such subjects as prayer, the Church, the Mass, and the Priesthood. It is hoped that this little book will serve as an effective introduction to one of the greatest and most effective preachers and spiritual directors of our times. Archbishop Fulton Sheen was a tremendous gift to all of us from Our Lord, who chose this humble and generous priest to be a great beacon of light and evangelizer, calling us back to a stronger and more effective love of God and neighbor. Archbishop Fulton Sheen is the real author of this book of quotes. I will forever be grateful to him for being able to bring these words of wisdom and grace to you.